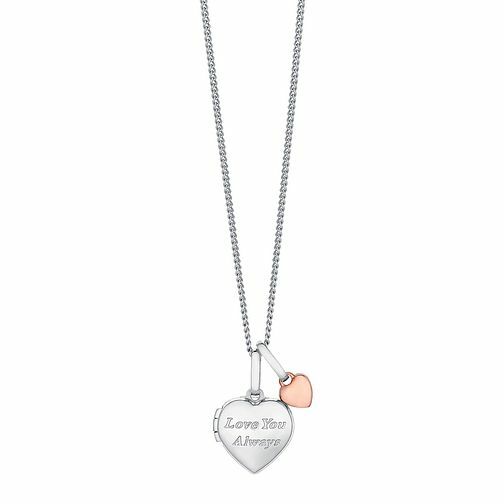 Engraved with the words 'Love You Always', this romantic sterling silver heart locket is the perfect place to hold keepsakes close to her heart. Crafted with an attached 9ct rose gold heart charm, this beautiful gift is sure to be treasured. Sterling Silver & 9ct Rose Gold Heart Locket With 18" Chain is rated 5.0 out of 5 by 2. Rated 5 out of 5 by Anonymous from Really gorgeous. This gorgeous heart locket is delicate and very beautiful. Perfect for my little 7-year old with just enough space for 2 pictures. I had the back engraved with her name, hsamuel did a great job with that too. Thank you! Rated 5 out of 5 by Anonymous from Good quality product with a nice discount! I ordered my purchase online for store collection and H Samuel kept in constant communication and delivered their promises. Timescales were on point and staff on collection day were very professional and approachable. The product itself was in perfect condition and I was even given a nice little complimentary box!